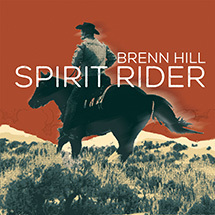 Defenders Recording Company announces the release of SPIRIT RIDER, the eleventh studio recording from Singer/Songwriter Brenn Hill. Recorded at Spiral Studios of St George Utah and produced by Brenn Hill and Ryan Tilby , this Faith-Based collection of original songs and popular Hymns was released March 31st, 2015. Featuring one of the West’s most dynamic solo artists surrounded by some of the music industry’s finest instrumentalists, SPIRIT RIDER gives bold insight to western life, the land, and the perspective of the Christian Cowboy. Popular Hymns like “How Great Thou Art” and “The Rugged Old Cross” are Cowboy Church Classics recorded in contemporary form while Andy Wilkinson’s “Power In the Wind” and Red Steagall’s “One Empty Cot In the Bunkhouse” leave you with visions of the Texas Canyons that inspired them. If you love and long for the West, if the Mountain is your Church, and if Christ is your Beacon, SPIRIT RIDER will take you to high places.